Over the past several weeks I’ve been working with a supplement company (Generation UCAN) to finalize a partnership and subsequent affiliation. I started using their pre-workout nutrition about a month before the 2013 USASA Nationals and have experienced great results. I had hoped to make the announcement in my next (this) blog post, but all the final details and webpage stuff (where you can purchase at a discount, etc.) aren’t quite dialed in yet. 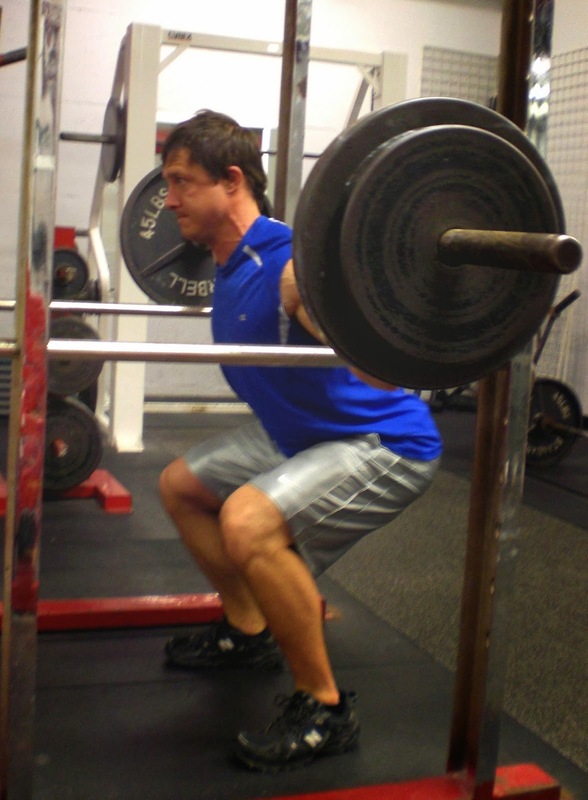 In the mean time enjoy this 20-minute squat article and keep an eye out for the upcoming supplement news. I’ve participated in a few different versions of performing successive sets of a pair of different exercises on the minute, every minute for a given amount of time (or every 30 seconds for a given amount of time, etc. ), which is a very high intensity style of training. I’ve also done timed main lift (DL, Squat, Press, OH Press) super-sets with both moderate and heavy weights (medium and low reps), but there’s no on-the-minute requirement, just get the work done before the time is up. It wasn’t until earlier this year that I started thinking about combining the every minute on the minute-style template with individual main lifts. There were a few Tweets from a gym in SLC about attempting to hit 300 squat reps in 30 minutes @ 225# (a few days later, bench was next at the same weight). At first I wasn’t sure if anyone was really going to try it or it was posted as a joke. About an hour or so later a few results were posted. While no one hit 300, there were a couple mid-to-higher 200-rep efforts. 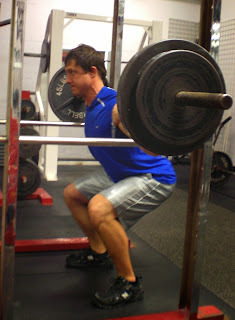 Besides being impressed and intrigued with the challenge, I started thinking about how someone could work up to that level of strength and endurance and how my athletes could benefit from this style of lifting. The 300-rep effort was something I experimented with at the beginning of my off-snow training this year, but after that week I didn’t focus on it too much. I had hit low-to-mid 200 reps in each lift (Squat, DL, Press, OH Press) but at a lower weight compared to the standard those gyms Tweeted. I liked the challenge and thought it was a good endurance building effort, which is normally the first phase of off-snow training anyway. I also thought it would be a good test each year to see how much strength/endurance I maintained throughout the competition season. After my first try I decided that on the next effort I would be able to get more reps done if I stuck to a certain amount of reps per minute (or every 30 seconds). Fast forward to a week or so ago: it was time for a short intermission before starting my pre-season conditioning phase when I started thinking about the on-the-minute-style again. While it might have been beneficial to repeat the 300-rep challenge at an increased weight compared to my 1st try (and still hit the same reps or better), I decided to use much heavier weights in an effort to get more comfortable with the test as it was originally designed. I knew I wasn’t at the level yet where I could do significant reps for 30 minutes with those weights, but thought 10 minutes was too short a time frame. Obviously no mystery there as to how I decided on 20 minutes. Weight selection on the other hand took a little more contemplation. In the squat, 225# was a recent 12-rep weight and I thought that at the very worst I could do a minimum of 60 reps (3 reps per minute average) at that poundage. The only lift where I used a different weight than 12-rep was in the OH Press where I used an 8-rep weight. I also scheduled a few assistance exercises for after the main lift 20 minutes was done. My personal goal was to hit from 85 to 100 reps with each lift at the given weights (225# Squat, 315# DL [dropped to 275# ½-way through], 185# Bench and 135# OH Press). Basically I wanted 5 reps each minute with 3 reps as a minimum if needed (and it was!). 70 reps was the squat result, which unfortunately didn’t quite get to the rep range I wanted. Sets 9 – 14 were where I lost the most ground rep-wise - overall though not a bad experimental training session. I had a similar result with DL and fared better with Bench and OH Press though still didn’t break the 100-rep mark. Bottom line I was really pleased with the effects (physically and mentally) of the 20-minute training sessions and plan to use them in a more structured way at different points of the off-snow training year. Would I change anything? Yes. If I could go back in time I would have used 205# (15-rep weight) and gone for 100+ reps. Also, I would have stared at a lower weight (15-rep range) for deadlifts too. I really enjoy trying new ideas and figuring out how they can fit in to my overall training schedule (and how it can help my athletes), but the snow is flying in the mountains and it’s time to start pre-season conditioning so I’ll have to wait until next spring before I visit this training style again.